A few days ago I read a post by Cassini from green-all-over about the decreasing bookmaker overrounds in recent years. I remember noticing the same trend some time ago and since I think this is an interesting topic for most punters I decided to do a detailed article about it. So today I will give you a closer look into the development of bookmaker margins in the online betting markets during the last decade. 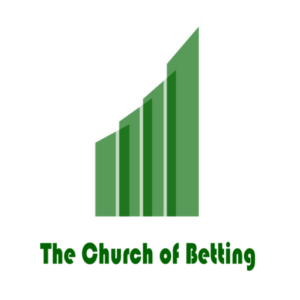 The bookmaker margin, overround or vig is the profit margin of a bookmaker from a bet a punter makes (assuming the bookmaker’s books are balanced). It is calculated by dividing one by the odds for every possible outcome and adding those fractions up. For example if a bookmaker offers you 1.92 for o2.5 goals and 1.89 for u2.5 that translates to (1/1.92+1/1.89) – 1 = 4.99% overround. An arbitrage is a group of bets with a negative overround. The better the odds a bookmaker is offering you the lower the overround and vice versa. A higher overround takes money out of the punter’s pocket and puts it in the bookmaker’s. So in a sense, a decrease in the overround indicates an improvement of the quality of service a bookmaker offers. This means we as punters can look into historical data to see what treatment we receive from the bookies and how it has changed over the years. I have taken odds data from football-data-co.uk for my analysis. The data includes odds from several bookmakers as well as aggregate average and maximum odds from BetBrain. Many European leagues are covered, but I will only look into the few main ones – England, Germany, Spain, Italy, France – to see how the margin varies across countries. I have gathered the data for the others as well so if there is any country in particular you are interested in just let me know. First I had a look into the development of the overround for the different tiers within a country. I have taken England as the dataset covers the widest range of leagues there. I have worked with aggregated data, looking into the 3-way (home-draw-away), over/under 2.5 goals, as well as Asian handicap markets. For all three markets there is a graph for overround based on average odds (left) and on best odds (right). This is where we see the most dramatic reduction of overround. The average overround got down from ~9.5% in 2005 to ~4% in 2016 for Premier League. The reduction was a bit smaller in relative terms for the lower tiers of English football, but still significant. The case is similar for overround using best odds, which for Premier League is negative since 2013 and for lower leagues is in the 0-1% range, a substantial decrease since the beginning of the period. An interesting detail is that 2015 was the only year in which the overround using best odds increased across all leagues, while in 2016 the trend got unclear. Meanwhile, looking at average odds, the decrease of overround does not seem to be slowing down in 2015 and 2016. Was that due to the fact that margins approached the 0% level and arbitrage started clearing market inefficiencies? Or was there less divergence between odds of big bookmakers from 2015 onwards? Later on I will use some further evidence from the data to try to answer that question. There is a decline here similar to the 3-way market but less pronounced. Across leagues the average overround has fallen from ~8% to ~6%. In recent year the gap between the overround of higher and lower leagues has increased as well, which is again somewhat similar to the 3-way market. And finally, there is the same jump in overround using best odds from 2014 to 2015. It seems this particular effect is apparent across markets. Asian Handicap seems to be the only market where the average overround hasn’t declined significantly during the years but has rather remained stable. The Asian Handicap concept has been considered an innovation some 15 years ago and while today it is established and understood by most punters it is probably still not as popular as the 3-way and Totals markets. Perhaps this is the reason why we don’t see the same improvement in the average overround for this particular market. We also see a spike in overround (both average and using best odds) in 2009, which is missing for the 3-way and the Totals. The overround has since returned to its previous levels. I am curious what happened in 2009 that caused this so if anyone has ideas please feel free to share. For all of the markets there are no significant differences in overround development across countries. 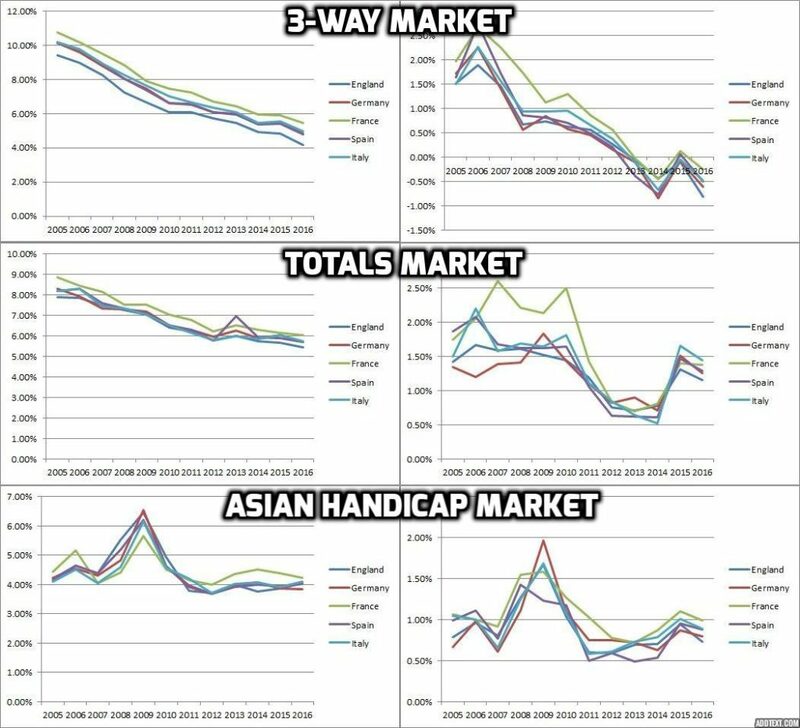 Again we see the steepest decline in average overround for the 3-way markets, followed by a milder decline for the Totals and a very small to none for Asian Handicap. Again as it comes to overround taking best odds there is an increase in overround in 2015 while the average for this year keeps going down, indicating a convergence of odds between different bookmakers. In terms of overround per country, we see the lowest overround for England, which is to be expected as this is perhaps the most commercial and watched league as well as the one attracting the most betting action. For the most periods/markets Germany, Spain and Italy follow with the second smallest overround, followed by France with the highest one. The overround differences across leagues are probably caused by their relative popularity, but those differences are not too big so a change of ranks in the coming years does not seem unlikely. Finally, a comparison between bookmakers offers a perspective on how the overrounds developed across different betting firms. If you use only one of those, perhaps you could find a bookmaker where you get better value for your money. Since we have already found out that differences between countries are pretty slim, I decided to go back again to the different English divisions and see how overrounds moved there during the years. Again we see that the overrounds have been declining across the board. The ones who were the most dedicated to offering higher odds to their customers seem to have done fairly well in attracting turnover, like bet365 for example. We also see, unsurprisingly, that only a few soft bookies can match Pinnacle’s odds for any of the leagues. Bet365 and Betvictor offer the best odds in English football from the soft book group and William Hill and Ladbrokes seem to be catching up although with some delay. But of course, as long as those bookies are available at your jurisdiction, regardless of their overrounds it makes sense to shop for the best odds among them for any given event. During the last 12 seasons overrounds in football were declining for virtually any bookmaker, any country and almost any market in the data set. The overround was declining the fastest for the 3-way market, slower for the Totals market and remained stable for the Asian Handicap market. The trend is pointing towards a further decline for the 3-way market and is rather unclear for the others. The analysis shows that the online betting revolution has truly improved the prices the average punter has access to. It takes longer for the mug punter to blow his bank than it used to. And even though the bookies have worse profitability per bet than they had 12 years ago, their presence online has allowed them to take an unprecedented amount of bets. The increased turnover has more than compensated the reduced profitability per bet, so their profits continue to rise. Of course some betting companies have done better and some worse in this new environment but the general trend is clear and every betting company needs to adjust to it. The overround using best odds on the other hand seems to have stabilized and even increased a bit in recent years. Is that a sign for some consolidation in odds calculation across bookmakers/odds calculating firms? Some insiders seem to believe that this is what the future holds for the betting industry. All bookmakers offering the same or similar odds on all events will basically eliminate arbitrage opportunities on the betting markets even with decreasing overround. Would this bring the end of profitable sports betting for everyone except the bookmakers? I personally don’t believe that would be the case. As the saying goes, if everyone is thinking the same, no one is thinking. Different methodologies for odds calculation and different perspectives on sports betting (even if some are on average less successful than others) are what makes the sports betting market efficient. I don’t think that a single odds calculator or betting company can take hold of the countless sports events worldwide which you can bet on nowadays. You have probably seen in my Trademate review that even Pinnacle’s odds are not perfectly efficient before closing. A week ago I have made a few e-games arbs between two sharp books, one of which was Pinnacle, which was another evidence for that. So my believe is that regardless of what the future brings, the betting industry will always have place for different kinds of players, big and small. A single sharp punter will always have the “little guy” advantage over the big books, being able to specialize in a single market and get his hands on odds-moving information before anyone else. This hasn’t changed so far even with all the amazing technology bookmakers have on their disposal and I don’t see it changing in the future either.